Posted on May 20, 2018 by burkely.twiest@noaa.gov. When severe weather is imminent across the country, forecasters at the SPC must consider all of the possible areas. However, here at the SFE where we are considering multiple experimental NWP ensembles, we have to select our domain of interest. 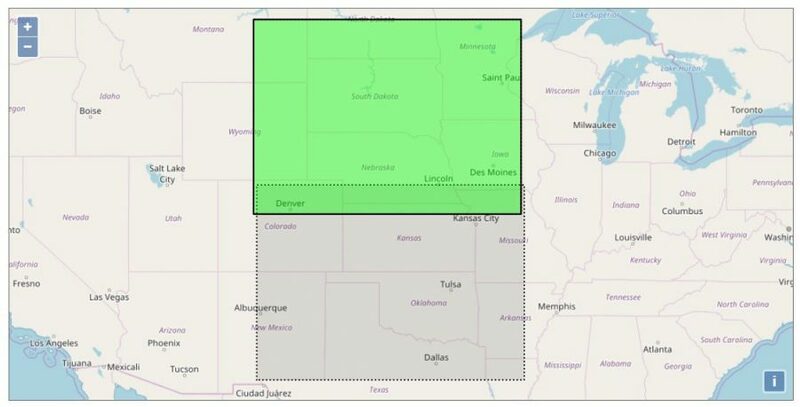 When the severe weather is spread across an area larger than a single domain, we must choose which region we want to focus on. To do this, the facilitators consult not only our experimental numerical weather prediction models, but also the upper-air data collected by radiosondes. Typically, the domains have quite a bit of overlap, but on days like last Thursday (17 May), a decision must be made between two very different areas. The two potential areas of interest for 17 May 2018, with the eventual selected domain highlighted in green. For this case, the upper-air information helped us decide which domain to choose, since the surface information didn’t favor one area over another. Ridging was a concern for the southern area, where rising heights could have suppressed convection. Adequate moisture was present at 925 mb and 850 mb for severe convection in the northern areas, with the total precipitable water value at Rapid City exceeding the 75th percent of climatology at 1200 UTC. The 1200 UTC sounding at Rapid City on 17 May 2018, showing high moisture and steep lapse rates. 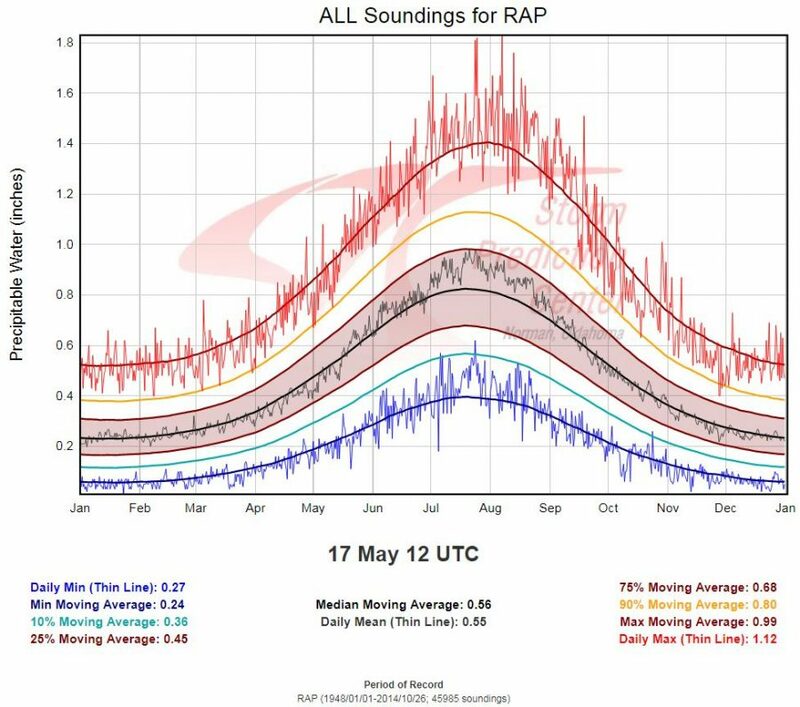 Annual sounding climatology for Rapid City, SD, with the statistics for 17 May at 1200 UTC displayed. 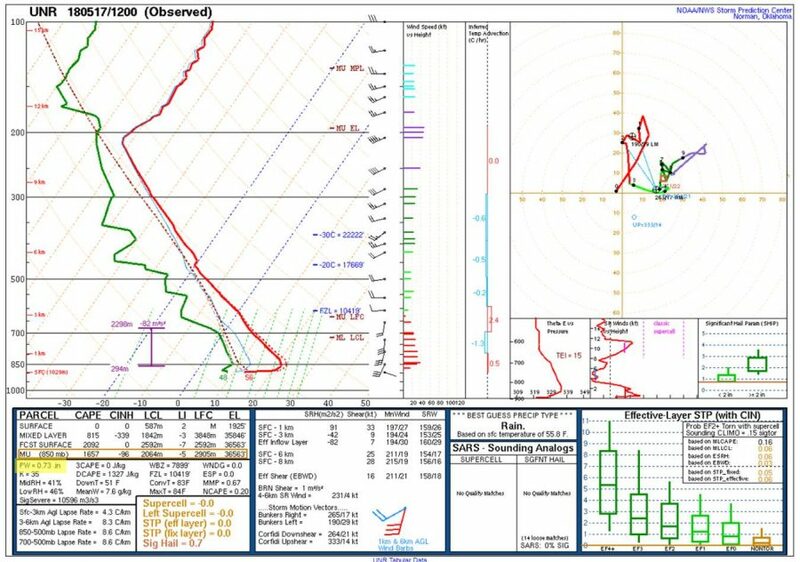 Soundings from Amarillo, TX, in the southern domain, did not have quite the same amount of moisture. Finally, difluence over Colorado and ongoing height falls at the 250 mb level led us to our final decision of the northern domain. 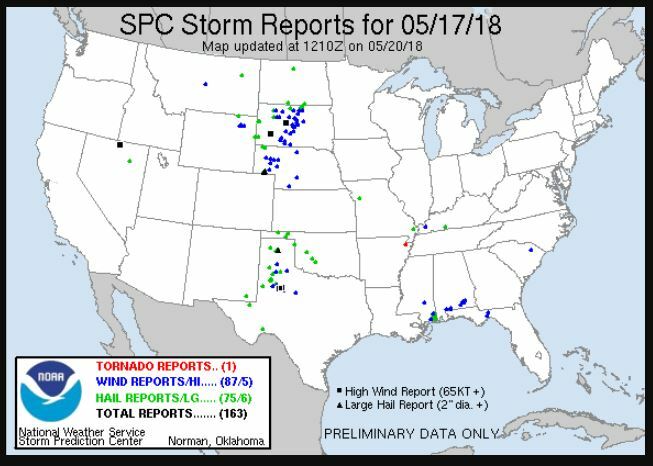 The distribution of the preliminary reports shows that both the northern and the southern domains produced severe weather, but that the coverage of reports in the northern domain was slightly higher, and was more varied between wind and hail reports, presenting a challenging forecast scenario. While there was no “wrong answer” as to domain choice for us last Thursday, we had to make a selection, and the upper air maps were our guide. Preliminary reports from 17 May 2018.